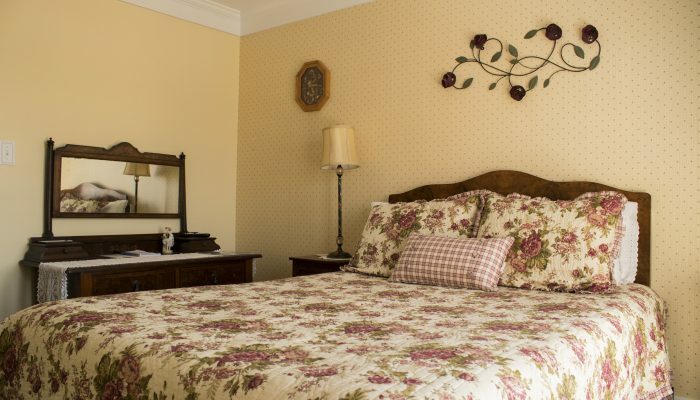 The Ginseng Queen Bed Room is located right at the top of the stairs with windows overlooking the west side of the Wildflower. The Queen bed has soft silky sheets and plush pillows that provide a delightful night’s sleep. The large private in-room bathroom has modern amenities such as a big walk-in shower, chair-height toilet, and pedestal sink. Soft, plush towels and washcloths feel wonderful on your skin. Free Broadband Wi-Fi is also always available. $99 per night. Two-night minimum on weekends Mar to Oct.